As we all know that Quora is one of the most popular site that helps to increase traffic to ones website. It is also good for getting good rank for website. I'm doing Q&A related work in Quora for last 5 years inside and outside Seoclerk. So I will do my best to get the most of it in order to get you as much traffic as I can. Yes you can buy Quora answers cheaper than this, but what you will invariably get for your money is low quality, nonsensical, badly spun content. Unreadable spun content will inevitably get removed from the website, flagged as spam and Deindexed by Google, or worse, it could even get your website penalized. Why take the risk for the sake of just a few dollars? Firstly I will search for questions relevant to your website and then I will post quality answers with contextual link in order to attract visitors to your website. If any of the answers get deleted, just inform me then I will immediately replace it with the New One. 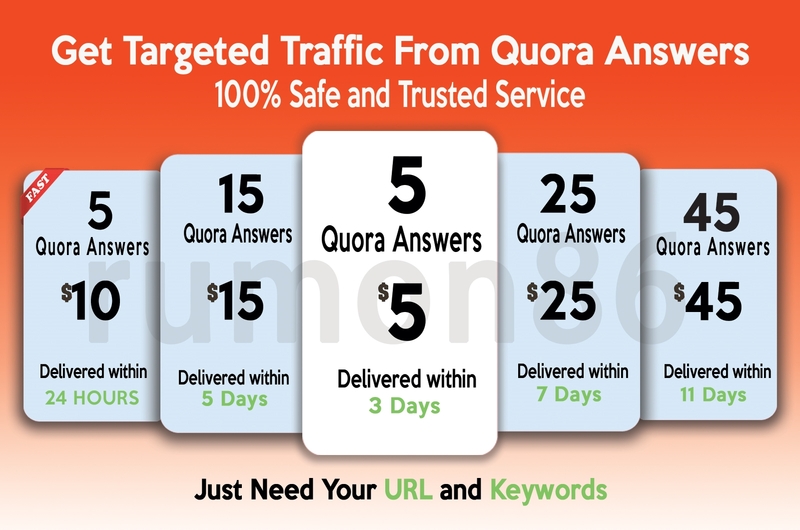 So get listed your website in Quora and get targeted traffic to your website. If you want to promote your website in Quora you should take this service. Promote your website in 5 Quora Answers with contextual link is ranked 5 out of 5. Based on 43 user reviews.